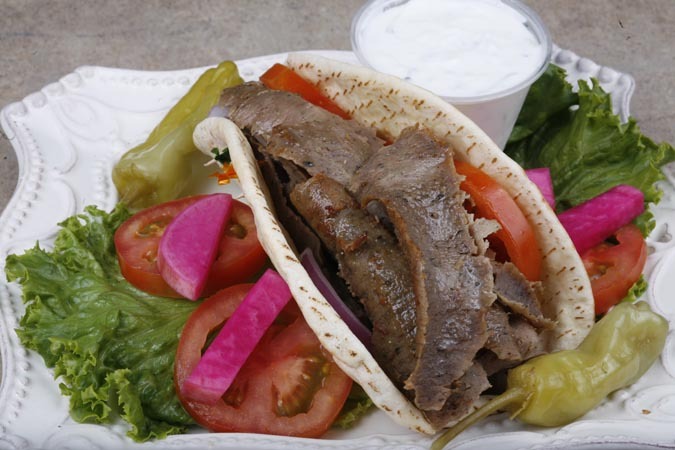 Not being a huge fan of meat, I will make the exception every time for one – gyro meat. I’ve heard many explanations for what exactly it is, but in my book it is good – which is all I need. It is the proverbial magic meat. Last week I won a gift certificate to Spinners in Rancho San Diego. I couldn’t be happier about this lucky win as Spinners is a fresh Mediterranean grill serving gyro meat amongst other regional favorites. I was told they make fresh tabouleh each day and that it was a must-try. I ordered a gyro wrap which was the most gigantic I’ve ever seen. It had a huge pile of meat with tomatoes, grilled onions and sauce. Pure deliciousness. I’ve officially never had better. Look out Daphne’s. Perfection. Additionally I ordered sides of hummus and tabouleh, which came home with me for a real pro to test. My mother, who grew up eating food from the Mediterranean and can identify good versus bad in a heartbeat, is visiting from out of town. Believe you me – it passed her test. The hummus was perfectly creamy and the tabouleh was the freshest I’ve ever had. I’m not often in East County, but if you are definitely stop by Spinners.